We know you share every little thing with your BFF’s! Why not share your love for Clovia with the squad? on your next purchase of ₹499 & above. This offer allows Rs.100 off on first order worth Rs.499 & above. The validity of the coupon is 30 days from the date of issue. 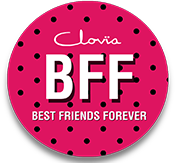 Invited friend should be new to Clovia to avail the offer. We will determine in our sole discretion whether the customer is new to Clovia. One BFF Code can be claimed by multiple friends. However, only one coupon code can be generated by a user. Referrer gets the code once the order placed by the friend is delivered. Management has the rights to extend or reserve the validity of this promotion. In case of any dispute, management's decision will to submit personal information about you and the customers you refer, such as name and email address. You agree to receive communications from us with regard to your participation in the Clovia Refer and Earn Program, and to allow us to communicate with your friends about your participation (for example, by disclosing to your friends that an invitation was sent by you). Any information collected from you or your referred customers as part of the Clovia Refer and Earn Program will be subject to Clovia’s Privacy's Notice.